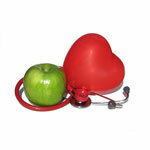 A good congestive heart failure diet will provide you with nutrients from a variety of food from all the food groups. The first four foods on the list are also cholesterol lowering foods because of the soluble fiber they contain. Your congestive heart failure diet should also have the right amount of calories to help you maintain your ideal weight. Congestive heart failure treatment includes diet and exercise, but sometimes more aggressive medical interventions are required. Medications may be prescribed to open up constricted blood vessels so the heart does not have to work as hard. Diuretics reduce the amount of salt and fluid in the body. Other medications help assure proper contraction of the heart muscle. A pacemaker may be installed to help speed up the heart beat. In some cases, coronary artery bypass graft surgery may be required. Congestive heart failure symptoms that you should be aware of include shortness of breath when you are doing an activity or when you lie down for a while. A cough that does not go away and gets worse when you lie down is another. The abdomen, ankles or feet may swell noticeably. Sudden weight gain may signal that fluid is being retained. This often happens with congestive heart failure. Some people notice that their pulse becomes rapid or irregular and report heart palpitations. Other common symptoms include feeling faint or weak, extreme fatigue, and difficulty sleeping. If you experience these symptoms be sure to consult your health professional.